English Springer Rescue America, Inc. (ESRA) is a national referral and foster care purebred placement organization and a 501(c)(3) nonprofit corporation. ESRA's mission is to provide foster care to English Springers impounded by humane societies, private shelters, and animal control facilities nationwide, as well as to offer adoption referral services for those agencies. There are no paid staff, and all our members do what they do on a completely voluntary basis. English Springers are as susceptible to impoundment as any dog. They are picked up off the streets as strays or relinquished by their owners because of a move, illness or death, financial crisis, or other troubled circumstances. Adoption referral assistance is also available to those owners who can no longer care for their Springers and must give them up for adoption. Through the compassionate efforts and commitments to help, ESRA's volunteer members have successfully placed thousands of Springers in new loving homes. 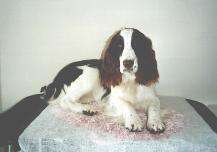 In March 1998, ESRA began with the development of a friendship between two ladies from opposite sides of the country who shared a passion for English Springer Spaniels. In 1984, Jan Flagg, a southern California resident, adopted a five-week-old puppy from a shelter in Carlsbad, California. This adoption brought the awareness of a rescue operation needed for these loving Springers. Judy Manley, an Ohio resident and breeder since 1979, was pursuing a project to form a rescue committee for the national breed club, the English Springer Spaniel Field Trial Association. These two kind-hearted ladies met, and a partnership began to rescue English Springer Spaniels, out of which ESRA was born. 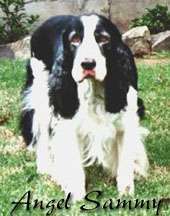 English Springer Rescue America, Inc. was incorporated in August 1999 in Orange County, California. On September 10, 1999, the organizational meeting was held in Oceanside, California, where a group of five people gathered (among them were Marie Devaney, Barbara Ellerbrock, Jan Flagg, and Christina Santos) to officially organize the rescue and served as the first directors of ESRA. In turn, the directors elected the first officers of ESRA, which included Jan Flagg (president); Judy Manley (vice president); and Christina Santos (chief financial officer/treasurer). The directors then identified 26 people who wanted to become members of the corporation and named them to membership. Jan Flagg, the founding president of ESRA, passed away in November 2002. Judy Manley served as president of ESRA for several months in late 2002 and as director emeritus from 2006 to 2009. From December 2002 to June 2016, Caryn Pola served as president of ESRA. Many Springers are assisted by ESRA every year, matching up many lucky Springers with the right home. My heart was really touched by the mention of my pound dog Sam and the consensus of you all to name our mascot dog after him. It was because of his loss that I began to shelter hop looking to adopt another. I wanted to find another just like him. We all know it's really not possible to replace exactly what we lost, but you don't realize that at the time of the loss. But I did find Sam's double, impounded in Oceanside. Although female, she was his color, his size, his markings, his age, it was Sam. When I saw her first, she was not yet shelter property (she came in as a stray). She was in deplorable condition, ears matted to the leather, bleeding sores on her muzzle and feet. The office staff there at the shelter never told me to put a hold of her. They never gave me a reservation slip to fill out. They never told me she would be put down the next morning if I was not there at 9 am. When I did go back for her, she was gone, euthanized because of ear infections. It was this very incident that put me into rescue. How dare this shelter decide that a dog in this condition had no worth and that no one would be interested in it. They couldn't be farther from the truth, as many of ESRA's own rescue dogs with special needs and such have proven. So, I am honored that all of you will also remember my Sam. He was a great dog; you all would have loved knowing him. By the way, the dog I did adopt thereafter was Samantha (named after you know who!). She's a far cry from the looks of him!